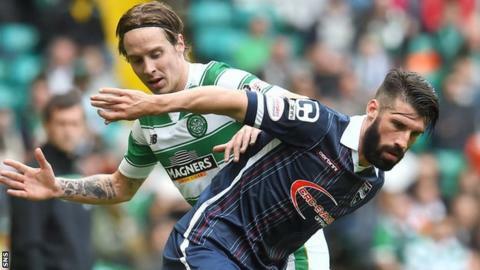 Ross County manager Jim McIntyre believes his side are capable of defeating Premiership leaders Celtic. But he concedes they will have to alter their tactics to combat the threat of their visitors. "We believe we can win any match," McIntyre told BBC Scotland. "There does have to be a different system deployed against Celtic. We lost heavily last season by really having a go at them and pressing them high up the park." County currently lie fifth in the league and are in the League Cup semi-finals after a positive start to the season, but the Dingwall side have lost three of their last four league matches. "It has not damaged confidence levels," said McIntyre. "When you analyse those games, we're certainly creating. "Where we've fallen short is just having that ruthless touch. "Even when we are winning matches, the Inverness game for instance in the Cup, we should have scored three or four more goals. "That's been the frustrating part in the last month or so. We are creating the opportunities, getting into the right areas, but we're just being a bit wasteful." McIntyre will guard against a repeat of that 5-0 defeat by Celtic last season. "You've definitely got to be a wee bit more cagey and a wee bit more structured in terms of making sure that you're not leaving wide open spaces," he said. "They have got players with pace and trickery that can really hurt you." One focus of attention for McIntyre will be the threat posed by Celtic striker Leigh Griffiths, who has scored 16 goals already this season. "You've got to pay attention to him," said McIntyre. "He's very hot at the moment. "He's just progressed and progressed each season from his young days at Livingston when I used to face him with Dunfermline, when he used to bang in goals for fun, but he's adding so much more to his game these days as well. "His intelligence and link-up play deserves great credit." Former Celtic midfielder Rocco Quinn is looking forward to facing his former team and believes County are a match for any side. "We need to produce a big performance," said Quinn. "A performance with a lot of positive play and self-belief. "We're a good side and it's our home game, so we need to take the game to them. "It's one thing that's never wavered since the start of the season, the self-belief that we're a right good side and, on our day, we can give anybody a game. "We believe they have weaknesses. One thing they're going to get here is a right test and a right good game. "There's a respect there because they're champions of the league but we also have to believe in ourselves."